Fashion flashes by on the runway in minutes, but the behind-the-scenes design and production work is much more painstaking and less glamorous. In New York, that gritty reality of fashion production -- so key to turning creative visions into actual clothing -- is being eroded by rising rents, the movement of manufacturing overseas, and the potential re-zoning of New York's Garment District. Then, to learn more about the current concerns of those who fear losing the crucial remaining production capacity left in NYC, read the op-ed from Nanette Lepore and Robert Savage that was published in the New York Times on (of course) Labor Day. And take a break this Wednesday at noon and head over the the Button & Needle sculpture (7th Avenue & 39th Street) for a "Save the Garment Center" rally. The dress code is fashion-forward, of course. Photo posted to Flickr by Eliane. Is Michelle Obama the new Barbie? First she chooses an inaugural gown by Jason Wu, who got his start designing dresses for dolls. 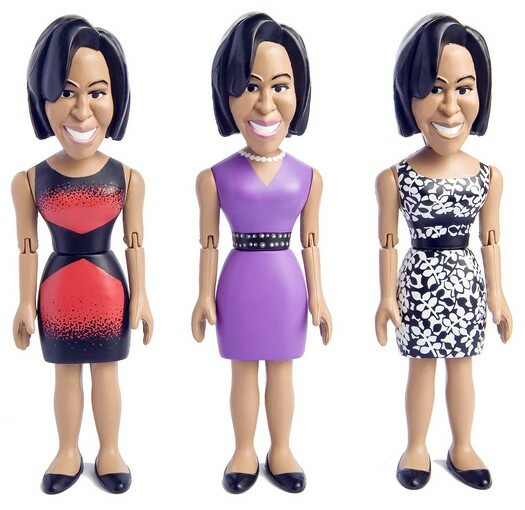 Now Brooklyn-based sculptor Jason Feinberg has created a series of Michelle Obama dolls -- er, make that "action figures" -- wearing dresses in which Mrs. O appeared during the campaign. Yes, there are the red-and-black Narciso Rodriguez from the acceptance speech in Grant Park, the purple Maria Pinto "fist bump" sheath, and the black-and-white Donna Ricco dress from White House/Black Market that entranced watchers of "The View." While the First Lady made her displeasure with Ty's "Sweet Sasha" and "Marvelous Malia" dolls known, it's unclear whether she'll object to seeing her own image in plastic -- or whether it would be good politics to attempt to decapitate the dolls with a right of publicity claim. (Yes, she's a public figure and the First Amendment protects speech; no, these dolls don't seem to constitute commentary of any sort.) Suffice it to say that the action figures were not authorized, but that overt legal action is not terribly likely. And what of the designers whose dresses have made fashion history? Paradoxically, if Feinberg had reproduced the dresses themselves and sold them in a Brooklyn boutique, their original designers would have had little or no claim under U.S. law. However, the same may not be true of the 6-inch versions. Let's consider each dress individually. Apart from the purple Pinto, which is probably too simple to trigger any sort of protection (belt sold separately), the doll-maker may run a slight risk of playing (court)house with his creations. Either Donna Ricco herself or whoever created the black-and-white fabric pattern might have a copyright claim, depending on how closely Feinberg copied the print. And if either Narciso or Donna created a sketch of his or her respective dress before stitching it, the drawing (though not the dress) would be subject to copyright -- making the doll theoretically an infringing derivative work. Of course, Feinberg presumably copied the dolls' dresses from a source other than the designers' original sketches (if any), most likely a press photograph. That brings up another copyright issue entirely, one with which Shepard Fairey is all too familiar. But then, which copyrighted photos served as Feinberg's source? At the end of the day, the doll designs strike Counterfeit Chic as more darling than daring, legally speaking. Perhaps a coordinating Pennsylvania Avenue Dream House will be the sculptor's next project? Many thanks to longtime reader Jamie Kiburz for the tip! Alexander McQueen may have incorporated his signature skull motif into this fall's "Faithful" motorcycle jacket bootie (below left), but it wasn't enough to scare away a true pirate. Steve Madden copies creative shoe designers so frequently and so, well, faithfully that it's often quicker to identify the few changes than to catalog all of the similarities. 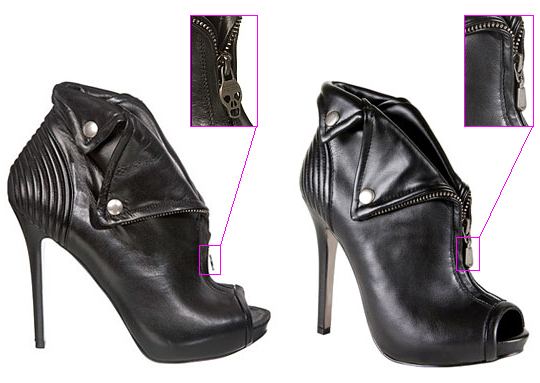 In this case of the Seryna bootie (below right), only the substitution of a plain zipper pull and a few minor details of construction (quality of materials, sharpness of the foldover points) give away the game. The real difference this time around, however, is that the knocked-off designer hasn't accepted being K.O. 'd -- and the next round will take place in federal court. But wait, you say, U.S. law doesn't protect clothing designs against copying. Hence Steve Madden's apparent business strategy: copy everything from sole to shoelace, but avoid the legally secured trademark. While the complaint isn't yet available online, lawyers for Alexander McQueen are part of an emerging trendlet, namely a return to trade dress claims. Ever since the Supreme Court severely limited the availability of trade dress protection for product configurations almost a decade ago, such claims have been few and far between -- and as a practical matter limited to famous, classic designs or design elements that have been around for years. The secondary meaning requirement hasn't disappeared, but determined attorneys representing clients from Louis Vuitton (against Dooney & Bourke) to Trovata (against Forever 21) have been working to reinvigorate this particular avenue of intellectual property protection. Success has been limited thus far, but legal reasoning springs eternal. For Alexander McQueen, this means noting that Faithful devotees have included Lindsay Lohan, Mary-Kate Olsen, Rihanna, and the photographers who fall at their feet. Surely, the argument goes, such extensive editoral notice has established a link in the public mind between design and designer sufficient to qualify for trade dress protection. Time -- and the Southern District of New York -- will tell. From a big picture perspective, if this trickle of trade dress claims continues, will it have a significant effect on the frequent copying of creative clothing? Yes and no. Established, well-known labels with large marketing budgets and/or celebrity clients -- in other words, those who could demonstrate that some of their most popular designs have secondary meaning -- would have more protection than they do now. Of course, those are also the labels least in need of additional protection, as many customers already seek out their (legally protected) trademarks. While counterfeiters of those trademarks abound, there is at least law on the books against such activity. Emerging designers, by contrast, are less likely to have their still-obscure trademarks counterfeited than to have their designs copied. And since emerging designers are relatively unknown and their designs are unfamiliar to the public, they are far less likely to qualify for trade dress protection and would suffer by comparison. Whatever the strength of the trade dress trendlet, it will be quite a few seasons before its full impact becomes apparent. In the meantime, Alexander McQueen will simply have to hope that his clients keep the faith.